Home / Releases / 4DO 1.3.0.0 Released! Oh damn Crash ‘n’ Burn is finally supported, i was waiting or this day. Man… I’m not looking for a 3DO emulator because emulators for this system was pretty crap in the past. When 4DO was created and receiving constant updates, I got hopeful!! Now, with addition of a support for a very difficult game to run in a emulator, I can say you guys are really dedicating in this emulator, and turning the 4DO the best 3DO emulator!!! Keep going, guys!! And Thanx to make Crash ‘n Burn runs in the 4DO, Viktor!! I am from Brazil, thanks a lot for the great conquest in all history of 3DO emulation. You are the best! Keep the good work! Sorry, but after the new release of the Emulator, the Game MEGARACE is unstable. I cannot run it at all! Hope, you can fix it in the future realeases, thanks! This is likely a side effect of the new core changes. Use version 1.2.0.3 to play this game until it is fixed in a newer version. By the way, some of the game issues experienced in 1.3.0.0 are because o the Crash ‘n Burn crazy hacks! Whoops! However, 1.3.0.1 (released shortly) isolates these crazy hacks so that other games aren’t affected. I believe this resolves Gex at least, I haven’t tested Megarace. I WAIT THIS GAME FOR A LONG TIME, ABOUT 10 YEARS, AND NOW I CAN PLAY IT!!! Hello again! This emulator is the best ever but, it could be better with some Graphic Filters. The native 3DO resolution is so ugly in fullscreen mode. The emulators for other consoles like SNES and PSX have filters that make look better. I hope you can put something to make the screen nicer. Thank very much fot the outstanding good work! After years, this game plays on PC! I am having speed/hickup issues, but It may be my rig (running on 1x800mhz lung). When I fix that, I will see how this thing runs. 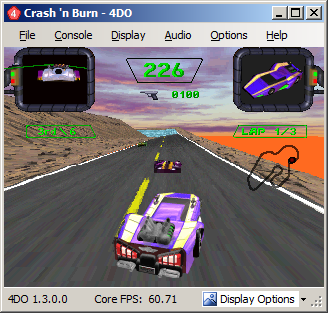 Crash’n’Burn seems to run “faster” than most games, which is more demanding on the emulating PC. I’m not sure why. My PC handles it well so I didn’t mind. But you can try the “Advanced” options and turn down the CPU speed, which may bring the game to a speed your PC can handle. Does anyone want to provide input on what the fix/workaround was? You should be able to figure out what the exact source changes were on the sourceforge page. Just check what changed between this revision and the previous revision. This is totally wicked, I’ve been trying to find CRASH ‘N BURN for a while and have found it!